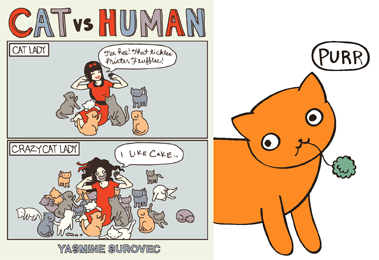 It's been a bit over 8 months since I started Cat Vs Human. What started out as a doodle of my cats turned into a blog, which, I can now say, will turn into a book! I am SO thrilled to announce that Andrews McMeel will be publishing Cat Versus Human, which will be released in Fall 2011! This was me when I found out. Do you like my Unisaur? It is a cross between a unicorn and a saur. I'll post more updates as things develop! Gosh, I also want to say thank you to everyone who has been so supportive. It's always nice to "meet" fellow cat ladies and gents. You're awesome! Congratulations!! This is awesome!! You deserve it Yasmine. Congratulations! These are wunderful news, I'm happy for you! Good for you! I love your webcomics, it lets me indulge the cat lady side of me while I'm living in an apartment that doesn't allow animals. And the unisaur is the best thing ever I've seen today. Concatulations on getting your book deal! How exciting! I will have to review it when it comes out! Well done! It's about time that talent and goodness get rewarded. You have both! My faith in mankind is restored. OMG, I'm so excited! I used to intern at Andrews McMeel! And now you will have an own book?! wow, it's so cool - if it will be released in germany, I will buy it!!! Congrats! I love your blog. I look forward to your book. But anyway, congratulations, you totally earned this contract with the publisher, and I hope to have it soon in my hands, via eBay or something similar (no frontier is gonna stop me from having the book). I love your blog and your drawings. Congratulations! I love your blog and I can't wait to buy the book. Yay! omg!!! im so excited!! your comics got me through my stem cell transplant, i can't wait to buy one of your books!!! Congratulations! I just love your blog! that's great news and I'm sure it'll be a fabulous book. Congrats! I hope you become international and your brazilian fans can enjoy it too! wow! congrats x 10! I haven't been able to sell anything! You're a real pro. That's incredible!! You are so talented, and I can't wait for the book! Congratulations!! I'm so happy for you!! OMG! congratulations!! !it was about time, i can't wait to buy it! congrats -- I'm a huge fan!! Can't wait to see it! Mazel tov! I so enjoy this blog and I am very excited for you! It's good to see hard work rewarded, and I absolutely love your blog... it's exactly like living in my little flat (not apartment!) across the pond. Yasmine, Thanks for the comment on my blog. I adore your work and am honored you stopped by. When I made up my Essential Internet Cats of 2010, one of the first things that came to mind was to make sure to include Cat Versus Humans. Your work brightens up the whole Internet. Thank you for sharing with us. thanks guys! i really appreciate it. kisses! That's great! I'm from Colombia, so getting the book will be dificult, but promise to do my best! Look at how many comment there are! We love your blog and we are going to love your book! Yasmin, that is so cool! I am really happy for you, congratulations. You deserve it, you put a smile on my face (and so many other faces) every time you post another one of your wonderful little artworks. I swear you must have looked into the life in our house, because every single thing you publish could have happened or did happen in our household at some point. 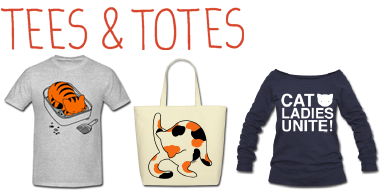 Life with cats is good, but it's even better when you illustrate it! 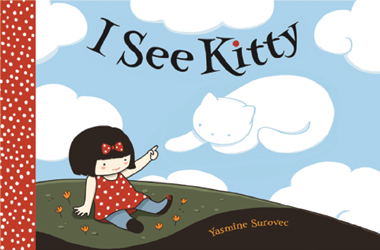 Wow, way to go, Yasmine! Andrews-McMeel puts out some amazing books - you undoubtedly know the "CATS' HOUSE" books by Bob Walker and Frances Mooney and their world-famous clowder? ConCATulations -- it couldn't happen to a nicer blogger -- or sweeter, funnier cats ;) Can't wait to see the book and hope it's the first in a long, successful series. Wow! Your art is truly amazing (coming from a cat lover)! Congratulations!! Glad to hear it, you deserve it. I will be in line to buy a copy when it comes out. That's an awesome news! Finally.. I just LOVE your work and adore you. Now you are the first astronaut/heart surgeon/olympic snowboarder with a cartoon book out. >>Now you are the first astronaut/heart surgeon/olympic snowboarder with a cartoon book out. Wow, that's awesome news!! I love your comics! I'm a cat teenager! :D I have a way with cats--they love me and I love them! I discovered your blog a few weeks ago and I'm already a fan! Concatulations on the book! I also would be HONORED to review it when it comes out as well! i discovered your blog a few months ago and was immediately hooked. Your drawings are so creative yet speak to my daily cat life so well! Congratulations on your book! And so far so good, I want to spread the word because it can save declawing and I'd never heard of it before. Purrfect! your comics are awesome and obviously deserve a book! ACK!!!! I"M SO EXCITED!! I am going to buy this book as soon as it comes out! You have already a buyer from mediterranean Barcelona! always loved your strips, always thought you're a genius, you deserve a publication and much more! Congratulations! But I'm not suprised at all!! I love Cat Vs Human! i just discovered your blog today. and i am going to keep coming back!!! i LOVE it !!!! i love cats :) and i'm thrilled to know you are turning this into a book :) all the best. gah! Congratulations! I can't wait! I just sent the link to this article to my boyfriend with the subject "easy present for me." I love your work so much. I'm thrilled!!! i can't wait to get it...Perfect place will be the coffee table for all guests to enjoy. THANKS !! Hooray!! Saurs and cats everywhere rejoice with me. With cake, of course. I've just stumbled upon your blog today and I can't stop laughing. yeah i agree with you all! I need to get it!